ZoneTrek is meant to help you navigate across the web; however, it is an advertisement-supported tool, which means that it is more likely to bombard you with potentially untrustworthy advertisements. The program has been designed by SuperWeb LLC, which means that it may be linked to completely unreliable parties. Malware researchers are well informed about this company because it is responsible for the existence of hundreds of different advertisement-supported applications, all of which we recommend having deleted. If you want to learn how to remove ZoneTrek as well, this report will provide you with useful information. Continue reading. SuperWeb LLC stands behind Bellaphant, Cantataweb, RockResult, and other infamous adware. These applications are always distributed using software bundles, simply because their installers on official websites have been disabled. Due to this, when you visit zonetrek.biz and click the Download button, you will not be presented with an installer. This is good considering that ZoneTrek removal is advised to all of this users. Of course, this report would not exist if the application was not active and if computer users did not try to delete it from their operating systems. The suspicious adware can be infiltrated with and without your knowledge; however, this does not change the fact that you should delete it. The main reason you should delete ZoneTrek from the operating system is the third-party activity. The so-called affiliated parties can install their own web cookies to track your activity and present their own banner and pop-up advertisements. Needless to say, these third parties are unpredictable, and you ought to review all associated Privacy Policies. If you do not, you may be tricked into trusting services linked to cyber criminals and schemers. This is a great risk, and so you may want to consider ZoneTrek removal carefully. If you do not want to delete the application, you should ensure reliable protection. Authentic security tools can activate automatic malware removal and ensure well-rounded Windows protection. 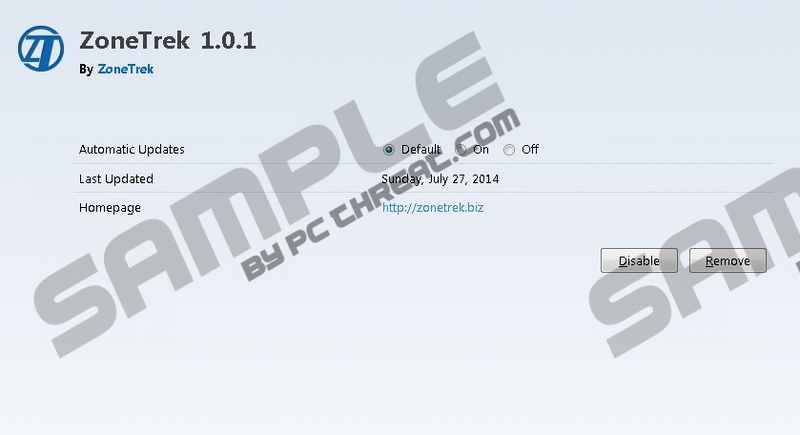 We recommend installing this software to have ZoneTrek deleted as well. Even though this is by far the best choice, some computer users choose to get rid of the application manually. The guides listed below will help you remove the undesirable application from the operating system. After that, you may need to delete the remaining adware elements and scan the PC for the additionally remaining threats. A legitimate malware scanner can alleviate this complicated task. Click the Start button on the Task Bar to open the user menu. Click the undesirable application and choose the option Remove. Right-click the application you wish to delete from the PC. Select Uninstall to get rid of ZoneTrek for good. In the Apps menu click Control Panel and then Uninstall a program. Find the undesirable application and right-click it. Select Uninstall and the application will be deleted from the PC. Quick & tested solution for ZoneTrek removal.